Edwin B. Forsythe NWR (AKA Brigantine) is a great place to see ducks, geese (including Snow Geese & Brant), Northern Harriers, Short-eared Owls, eagles and Rough-legged Hawks. After birding the refuge, the group will head to nearby Mott's Creek for raptor watching. A refuge pass ($4; can be purchased that day), Golden Age Pass, or federal duck stamp will be required for each vehicle to enter the NWR. 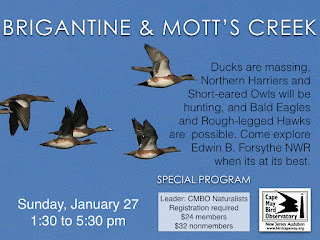 Join Janet Crawford, Karen Johnson, and CMBO Naturalists on this exciting Special Field Trip. Registration required.